"Do you ever find yourself loving a book so wholeheartedly that you wished you could dive straight into the author’s head and discover all their inspirations and secrets? 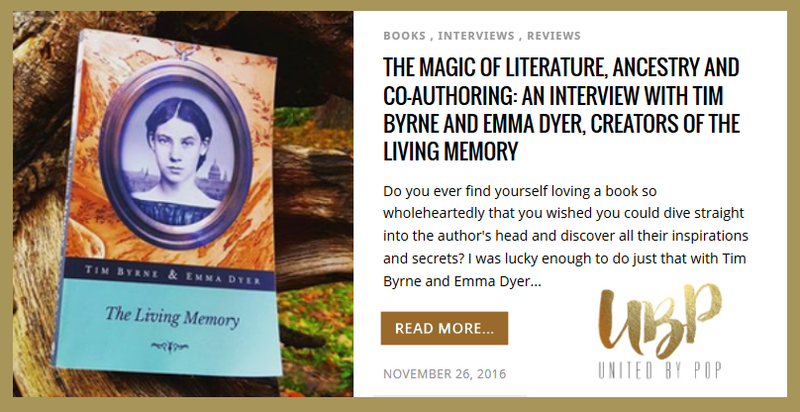 I was lucky enough to do just that with Tim Byrne and Emma Dyer, the authors of The Living Memory. This astounding historical fiction, incorporating time-travel, magical realism and Victorian London, captivated my attention from the very first page. And had captured my heart by the end of it." DE: I see you draw influence from a number of prolific authors, from Neil Gaiman to George Eliot. What is it about these authors that captivates you? What did you, if anything, draw from their own literature that helped you in the creation of your own? The Living Memory is available in the UK and the US. I was provided with a copy of the book in exchange for an honest review. All opinions are my own. 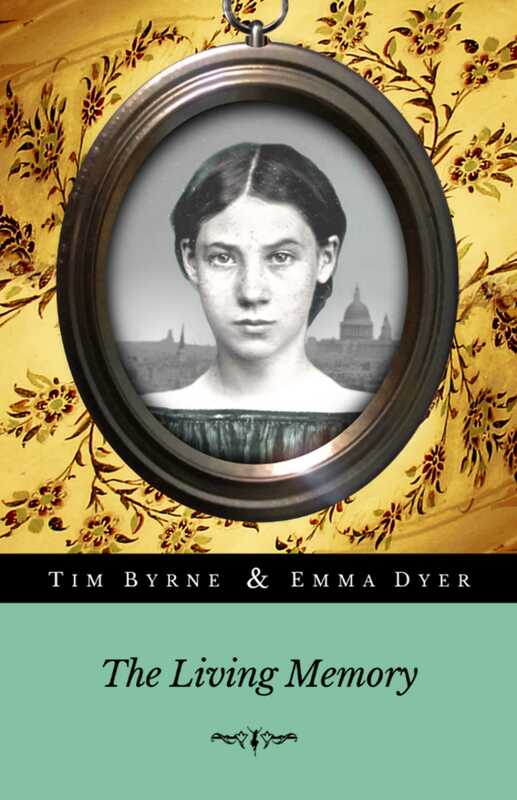 Thank you to the authors, Tim Byrne and Emma Dyer, and the publishers, Opposite Books, for this opportunity. The girl in the bright doorway was tall and elegant with sharp, bird-like features and gracefully wavy blonde hair. Though she was dressed in a simple cardigan and jeans, I noted that the brand was a particularly expensive one. This girl was obviously wealthy and she seemed to have noticed right away that I was not. ‘You’re Io? Here to audition?’ she said, looking at me doubtfully. ‘I’m Melia Bartholomew,’ she said, as if that was an answer to my question. She clearly wasn’t used to helping anyone with anything. Josie had a careful, cat-like way about her. She looked serious, in a way that I liked, and she was dressed in plain jeans and a shirt that could easily have come from my own modest wardrobe. ‘Not everyone wants to be a soloist, it’s a lot of pressure. I’d rather have a life of my own at the end of the day,’ she said. I found myself matching her smile. I didn’t have to worry about pressure, that wasn’t going to be a problem for me. Melia was trying out the weight of the smallest and lightest of my bags, leaving the others for me and Josie. The car pulled away, crunching gravel, and when it had gone I noticed how silent the house was without the purr of the motor in the background. The Royal Lodge was the school where my mum had studied and it was apparently very prestigious. Things like that don’t mean much to me so everyone was quite surprised when I agreed to go to an audition. The building itself was a tall, beautifully square mansion, styled to give the impression that it had once been some kind of castle, though it definitely hadn’t been anything of the kind. Crenellations lined the top of the wall but they were just for show. Carvings in the stonework pretended to be narrow slots where archers could defend the main entrance, but they were just decorations. I followed Melia as she led the way inside. Shouldering the rest of my bags, Josie and I followed her. I looked up at the stairs as we passed. The whole school seemed to be set up as some kind of show of its own self-importance and I sensed that Melia was playing a part she had practised many times. The theme of this little show was simple: the school was a very special place and only special people were accepted here. ‘Going the long way means we can give you a quick tour on the way up,’ said Josie, warmly. We went on through the library with Melia playing the part of a tour guide: ‘The library was one of the reasons this house was originally built: the first Earl had a great love of both music and literature.’ She led the way across the plush carpet between the tall, dark stacks of books. My memory blossomed with details and I simply repeated something I’d read on the website to make my point, ‘…The sisterhood’s love of learning was inspired by stories of the Lady Christina Mirabilis. They built this place to help the poor and the needy…’ I gave Melia a smile and shrugged. I wasn’t trying to irritate Melia but she did seem to deserve a little irritation. From the way she acted towards me I got the feeling that she behaved like this with anyone new. Maybe she tried to frighten new people a little bit. She seemed to see herself in competition with me, but she had no idea who she was dealing with this time. Josie was different. She gave me a tiny grimace behind Melia’s back. At least one person here wasn’t crazy about being competitive. Beyond the next set of doors was a much larger space: this was the Performance Hall. I followed the others into the long gallery room that ran along the whole breadth of the house. It was darker in here. A couple of lamps were lit around the staircases at either end, and I could just make out a raised stage with a grand piano in the centre of the room. I imagined what the room would be like with an audience, all of them focusing on the stage, staring from all sides. Nothing much can make me nervous but the way things were set up gave me a shudder. I went to take a closer look at the piano. Josie closed the doors behind us. Now that my eyes had got used to the gloom I could see that this piano was a particularly beautiful instrument. The shine of its lacquered surfaces reflected the dim light as darkly as the glass in the windows. It had been placed on the stage facing towards the back of the building with a view of the gardens. ‘It’s lovely, can I try it?’ I asked. ‘Actually, I’m quite happy with how my pieces are coming along,’ said Melia, putting down my bag. She stepped past me, seated herself carefully on the piano stool and launched gracefully into Ravel’s Ondine. I knew that piece very well. Ondine had been specially written to be difficult to play and impressive to an audience but Melia was actually tackling it brilliantly. The sound of the piano was full and clear in the dark hall. The piece was about a water nymph who was singing stories of the dark depths below. The music began with the piano imitating the sound of rainfall, light and twinkling, before the music surged and swept, drawing the listener in completely. The amount of energy and precision that was needed to perform it was an extraordinary challenge for anyone. Melia was no more than three or four years older than me and yet she played the piece with a natural ease that was quite breathtaking to watch. It was only when she broke off that I could see what a strain it had been for her to play it so well. ‘You’re really very good,’ I said, letting the genuine respect I was feeling creep into my voice and soften my tone. I slipped down onto the stool and edged Melia out of the way. I fell gently into a state that I’d come to know quite well. I was completely absorbed by my memories. I pictured a performance my mum had given that I’d been forced to sit through when I was very much younger. I replayed the memories of my mum’s fingers finding their place on the piano keys. Then, with a well practiced surge of concentration I imagined my mum’s fingers matching up with my own. I felt my muscles obeying my memories. It was easy to let it happen, like humming along to another person’s tune. Once I had made the connection I didn’t even need to think about it, it just happened; my movements locked together with the memory like pulling up a zip. I found the exact place where I wanted to begin and placed my fingers on the keys. Then, I started to play Ondine from exactly the place where Melia had stopped. The music flowed flawlessly, the surging waves of sound, rolling and booming from the beautiful instrument. I hadn’t known whether I could start in the middle of such a complex and difficult piece but, of course, why couldn’t I? I was replaying a memory that was always the same and it didn’t matter whether I started at the beginning or near the end. I copied the sureness of my mum’s years of practice and the smoothness and confidence of the performance was very clear for all to see. As I finished playing, I noticed a new depth of silence in the Performance Hall. I let the memory fade, relaxing my focus upon the past and returning to the darkness of the present. Melia and Josie were both dumbstruck by my performance and it was hard not to giggle at them. Although I was tempted to tell them how easy it was for me, I chose to say nothing at all. Melia broke the silence in a timid voice that I hadn’t heard from her before. ‘We should show you where your practice room is.’ She seemed quite shaken up by seeing me play something like Ondine so casually. I could see why it must have been hard for her. If a champion athlete met someone who could run twice as fast as them without even trying, they’d probably feel pretty bad about that. Trying to ignore the awkward silence, I followed Melia and Josie up the stairs towards the practice rooms. When the house had been a convent, those rooms had been study chambers but now they were dedicated practice rooms with the best instruments and equipment to support the school’s elite students. I hadn’t realised that Melia had even known who my mum was, but after hearing the admiration in her voice, her coolness towards me made even more sense. She must have thought that I only got an audition because of my mum’s fame. She thought she’d catch me out but now that she’d seen what I could do she had dropped her attitude completely. ‘I know you’re only here for an audition but once you’ve been accepted, you’ll get a room like this all to yourself for the whole time you’re here,’ she said, steering me around so that I could see inside. Lights flared into startling brightness, illuminating a small, immaculate room with plain white walls. There was a jet-black, upright piano standing to one side that filled nearly half the space. The other half of the room was taken up almost entirely with a small desk that had a computer and some expensive-looking microphones on it. I was slightly embarrassed by their new attitude towards me, especially coming from Josie. She had seemed much friendlier before I’d played Ondine. I would have picked a simpler piece to show them if I’d known it was going to be so hard for them to get over it. I felt a tiny, cold shiver as I looked at the computer. If it recorded every detail of what I did, would it show up that my performances were the same every time? I didn’t like the idea of that. It probably wouldn’t matter. The whole point of practicing was to play things in the same way every time. As long as I did that, nobody would care what the machines recorded. ‘I’m pretty tired,’ I said, feeling a sudden desire to be on my own. ‘I’m sorry, you’ve come all this way and we’ve dragged you right around the building,’ said Josie. Melia led the way back through the entrance hall but this time we walked across the landing at the top of the stairs, looking down on where we’d come in. The statues didn’t look so grand now that I was above them. This place really wasn’t so special after all. Crossing into the other wing of the house we passed a few empty bedrooms before we got to mine. There was a printed note on the door. It said, Io Bride’s reason for being here is... the rest of the paper was blank. ‘What’s this?’ I asked. Was it some feeble attempt to bully me or make me doubt myself? I stared at the slip of paper, suddenly unsure of what mine would say. ‘What’s yours?’ I asked Melia. ‘Perfection,’ she said, looking slightly embarrassed. I wanted to see more examples but all the rooms around mine were empty, their doors standing open, ‘How many students are actually here at the moment?’ I asked. Playing Ondine had been enough to turn Melia into a completely different person but I wasn’t sure I liked this new version of her any better than the last one. She had gone from being loud and boring to meek and grovelling in no more than a few minutes. ‘Have you got everything you need? The bathroom is at the end of the corridor,’ said Josie, looking around my empty room. She seemed standoffish and confused by me now, as if I was something like a teacher in disguise. ‘I’m fine.’ I smiled as if everything really was fine. When Melia and Josie left I took a breath. Then I sat on my new bed and looked at the pinboard. I couldn’t write that, could I? Then I realised that I really didn’t care. Why would I want to fit in? I was just passing through. It was pretty obvious already that I was too good to be here. It would become clear to everyone soon enough. Then I could probably just move on to doing professional performances straight away. I started to unpack my things and get ready for bed. I tried to sleep but I was restless. The unfamiliar walls seemed very bare and I wondered how long it would take for this little room to feel like home. Not long, I thought. I had ways of making friends with a new place that nobody else could even imagine. ‘Jupiter,’ I whispered. There was really no need to say the word out loud, all I needed to do was think it. I heard the scuffling of tiny paws nearby. Right away, I let my hand drop down beside my bed into the dark. There, waiting for me, was exactly the memory I’d called for. ‘Hello Jupiter! There’s a good boy!’ I said, in the privacy of my own imagination. Under my hand, I could feel the memory of the soft, fluffy fur and the dancing heartbeat of Jupiter, my aunt Rosalind’s German shepherd puppy. I rolled onto my side and looked down at the perfect recollection of the friendly little dog, he looked up at me and started wagging his black and gold tail immediately. Jupiter had a beautiful, thoughtful face and he seemed to be watching my every move. I could feel his liveliness and attention. For a moment it made me utterly happy to see him. This was one of my favourite memories to replay when I was troubled by something. He never failed to calm me down. I had only met the real Jupiter once and even then I’d only played with him for a little while. But in those few minutes I’d been so delighted that I memorised every joyful detail about him. The real Jupiter hadn’t done anything more than roll around on the floor and wag his tail, but the Jupiter that lived in my imagination was much more talented than that. ‘Jupiter, will you go and patrol please, just to make sure everything’s alright?’ I asked. He gave me a tiny nod before padding off to check up on things. My Jupiter knew exactly what I meant when I talked to him, he would never make a mess, he’d never get sick and he’d never get any older, he was practically perfect in every way. I’d discovered that if I really loved a memory, the way I loved Jupiter, I could easily do more than just replay what I remembered. I could use my imagination to mix up the memories and play with them in different ways. When I imagined things like this, my memories were so clear that I could see and hear them too. Jupiter scampered over to my window and hopped up on the small desk to look outside. Then he jumped silently down again and trotted off, checking in all the corners of the room before he reached the door. He stopped there and looked back at me. I blinked and he disappeared. I imagined Jupiter padding silently down the stairs and checking in on the quiet corridors of the Royal Court. Everything seemed fine there, the school was asleep and the soft lights of the performance hall shone silently on the gleaming piano. When I blinked again Jupiter had slipped outside and he bounded about, stretching his legs. He ran through the long grasses and investigated the grounds of the music school quite happily. I only had a few memories of the school’s surroundings but I could fill in the gaps from maps and photographs that my mum had shown me. When Jupiter stopped to look towards the outside of the school I could see everything he saw. Though it was the middle of the night, I imagined everything lit up with golden sunshine. It made everywhere seem so friendly, so I couldn’t have been more surprised when I saw a dark shadow moving at one of the windows. Jupiter snarled and barked. I blinked and I imagined myself appearing beside him at once. I winked into existence inside the memory as easily as changing my mind. As I nuzzled down into my pillow I remembered about the audition the next day. Knowing what I could do, it didn't worry me at all. “Curves of Ali-Qapu” by Hamed Saber Digital Photograph https://www.flickr.com/photos/hamed/1313923579 by Hamed Saber https://www.flickr.com/photos/hamed/ Used under Creative Commons licence https://creativecommons.org/licenses/by/2.0/ Taken on August 17, 2007 Modified from the original, reoriented and contrast enhanced.